The Charles S. Caffrey Co. 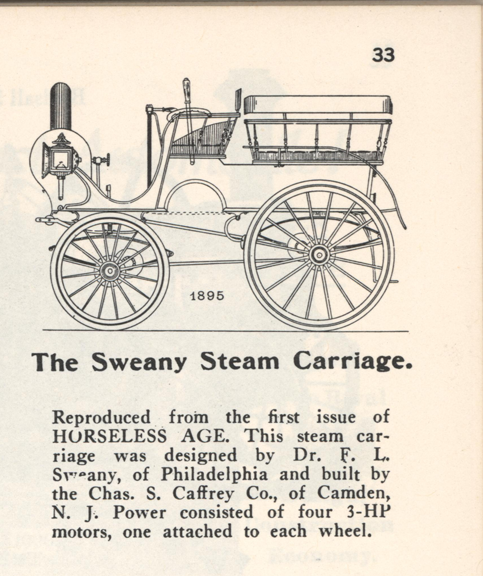 The Sweany was a most original steam car driven by four small 3 hp single-cylinder engines acting directly on each wheel. Steam at 150 psi was provided by a single water-tube magnesia-lined boiler mounted at the front of the car. Hardly surprisingly, it never went into production. This image is copied from Floyd Clymer's Steam Car Scrapbook, page 33. Georgano, G. N., Encyclopedia of American Automobiles, (New York, E. P. Dutton & Co., 1968), p. 193.